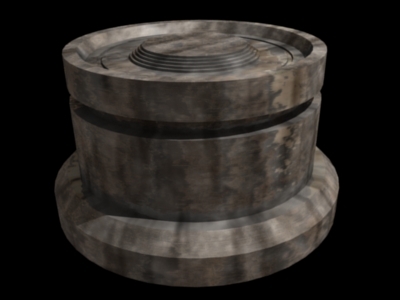 The restraining bolt is a small, cylindrical device that is used to place a droid under complete control of its master. The bolt is placed at specific locations on a droid, with location varying by droid type, and is remotely connected to a controller device that allows the user to direct the actions of the droid. While each droid must be fitted with its own bolt, the controller has the ability to be used with multiple restraining bolts at one time. The bolt itself works by disrupting specific electrical pathways within the droid that normally relay motor impulses to and from the droid’s central processing unit, thus allowing it to function but have no self control. Since the bolt does not disrupt the droids normal function, it is imperative that the user place the bolt properly. There have been many stories of droids that were able to escape their masters due to improper placement, and in a few horror stories of military and assassin droids, the master was never able to make the same mistake again.